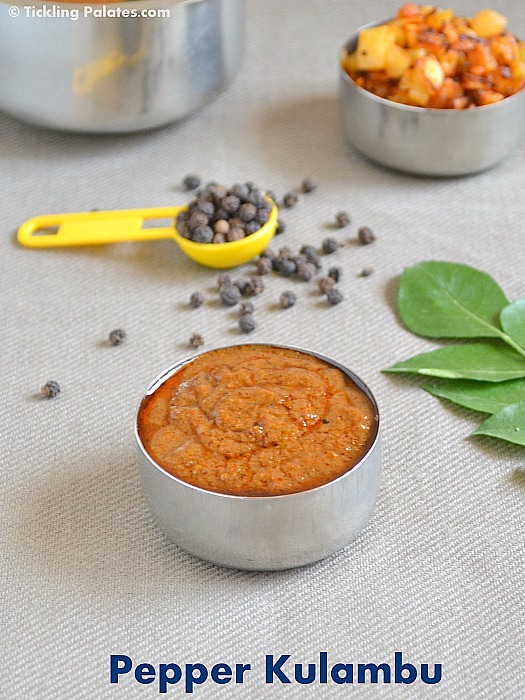 Milagu Kuzhambu recipe with step by step photos. 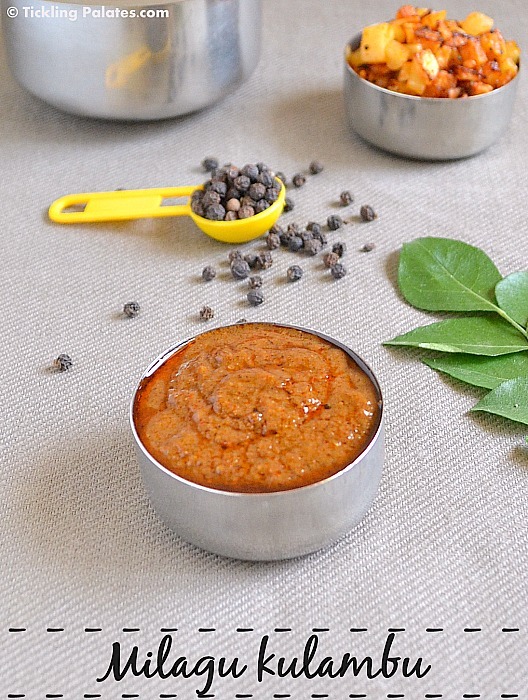 An easy no onion – no garlic, milagu kulambu that is traditional, spicy, tongue tickling and flavorful made using whole black pepper corns. Its a very good recipe to treat cold or a wonderful comfort food to have for lunch during winter just like milagu rasam. It also makes a perfect travel food as it does not spoil quickly and keeps well for some days. Milagu kuzhambu and paruppu thogayal makes a rocking combo on any day. This kulambu is very easy to make and takes just 15 mins or so to make. Its not only eaten along with rice in my home but also as a side with idli or dosa along with any chutney. You can always adjust the whole spices according to your taste and spice buds. Also when having it with rice, add a big dollop of ghee to the hot rice as it will reduce the body heat. 1. Heat a pan with 1 tsp oil. Add black pepper corn, dry red chilies, urad dal, chana dal, coriander seeds, cumin seeds and roast over low flame to golden brown color. 2. Turn off the stove and add curry leaves and mix well. The leaves will get cooked in the heat of the pan itself. Let it cool completely. 3. Transfer the contents to a mixie jar. Add the soaked tamarind along with the water and grind to a smooth paste. 4. Heat the same pan with the remaining oil. Add mustard seeds and when they splutter add asafetida. 5. Transfer the ground paste, turmeric powder, salt, add more water if needed to the consistency you would prefer. Mix well and simmer the flame completely. 6. Let it come to a boil. When you see bubbles all over, switch off the stove. This should take anywhere between 7-10 mins. By this time the oil will start to float on top. Add the jaggery and mix well. Close the pan tightly with a lid and let the kulambu rest for 10 mins for all the flavors to merge together. 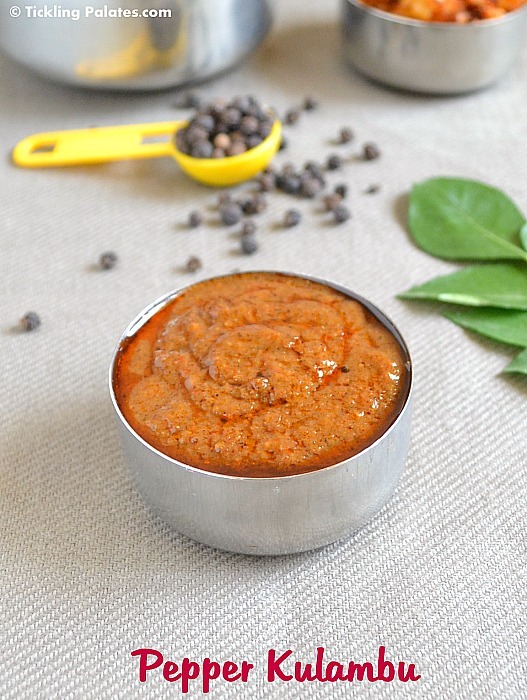 Serve this milagu kuzhambu with hot steaming rice or as an accompaniment with either idli or dosa. 1. Don’t overcook the kulambu as it will turn rancid and will give a bitter aftertaste. 2. Do not miss out on the jaggery as it enhances the tangy taste and also reduces the sharp spiciness of the pepper and chili. 3. Use gingelly oil to make this kulambu but if you do not like the flavor use any vegetable oil of your choice. 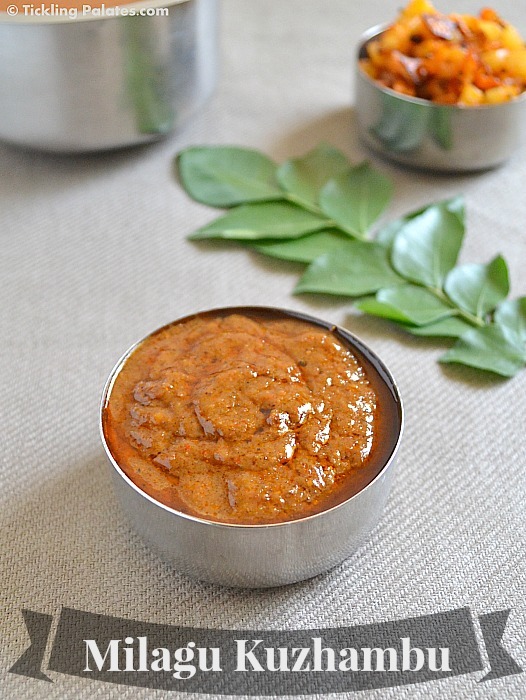 Easy Milagu Kuzhambu recipe with step by step photos to serve with rice. Heat 1/2 cup water and soak tamarind in it. Heat a pan with 1 tsp oil. Add black pepper corn, dry red chilies, urad dal, chana dal, coriander seeds, cumin seeds and roast over low flame to golden brown color. Turn off the stove and add curry leaves and mix well. The leaves will get cooked in the heat of the pan itself. Let it cool completely. Transfer the contents to a mixie jar. Add the soaked tamarind along with the water and grind to a smooth paste. Heat the same pan with the remaining oil. Add mustard seeds and when they splutter add asafetida. Transfer the ground paste, turmeric powder, salt, add more water if needed to the consistency you would prefer. Mix well and simmer the flame completely. Let it come to a boil. When you see bubbles all over, switch off the stove. This should take anywhere between 7-10 mins. By this time the oil will start to float on top. Add the jaggery and mix well. Close the pan tightly with a lid and let the kulambu rest for 10 mins for all the flavors to merge together. Some Indians live in Australia but they are remember every time the Indian foods. So the Indians are make spice and testy foods in Australian kitchen. 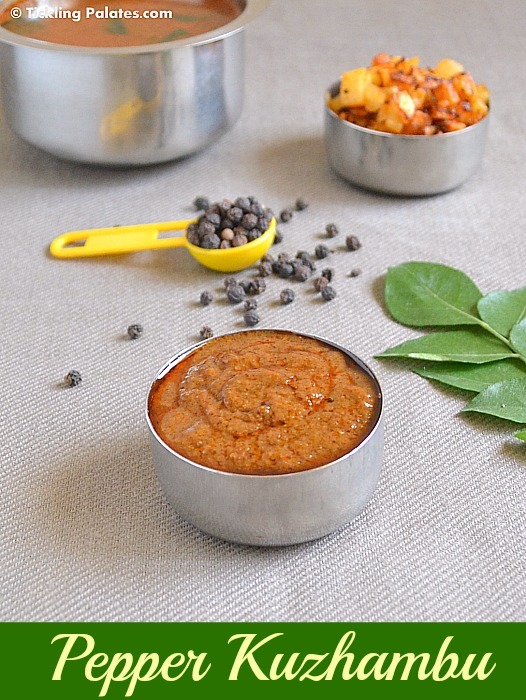 Very delicious and super healthy kuzhambu…. Thanks for trying it out and letting me know Roshni. Hope you liked it. Spicy and aromatic kulambu… looks tempting! The color will depend on the tamarind you use too. old tamarind will yield darker color and it tastes much better than new tamarind (Pudhu puli). Very nice recipe! Thanks a lot! It came out very good, like my mom’s cooking!!!! Thank you so much Sita. You made my day and I feel so humbled. Keep visiting. I tried your milagu kulambu its yummy and tasty, healthy and easy cooking recipe without using onion and tomato. Thank you.